In 2010, our first project was 50 Laptops Benefiting Children's Memorial Hospital in Chicago, IL. As mobile learning technology continues to improve, more opportunities are available to provide high-quality learning without a classroom. When access to education is limited, children's learning opportunities become limited and dreams are hampered. To improve access, mobile learning devices such as a new generation of small laptop computers, commonly called "netbooks", can be highly cost-effective means for providing 1-on-1 learning for kids unable to attend a formal classroom. To make a donation to your community children's hospital and purchase a rugged netbook for yourself, send an email to info@RightStart4Kids.org and one of our volunteer's will get back to you with more information. The following is summary sharing with you what we have learned from our experience. We highly recommend to configure each netbook with high quality education games and learning programs. For free & fun software, visit www.e-learningforkids.org. Below are detailed instructions and configuration options for preventing kids from visiting non-approved websites as well as recommendations for laptop security cable locks to reduce the netbooks from disappearing. If you have questions, feel free to send an email at info@RightStart4Kids.org and we will recruit a experience volunteer to help answer your questions. We started this initiative with 6 laptops donated on Oct 30, 2009 for a pilot at 6West. On Tuesday, May 18th, the Chicagoland Learning Leaders & Rotary Club of Winnetka-Northfield achieved our 50 laptops for Children's Goal at a magical night of celebration benefiting Children's Memorial Hospital. Many thanks to all the donors and corporate sponsors. On Friday, Matt Voll our RS4K volunteer conducted a short training session with a number of the nurses at CMH. Workshop topics included "What is E-Learning" and how the Health and Life Skills educational courses from www.e-learningforkids.org can help the kids feel less scared. Matt also gave them a short crash course on the ClassmatePC Tablet and how to use them. What are initial goals of our 6Netbooks for 6West pilot? The initial project pilot requires six netbooks for a 22 bed unit where 15% of kids stay 10 days or longer per month ... then quickly expanded to a goal to provide 50 laptops. After this successful project, we would like donate more netbooks to kids when they are hospitalized. 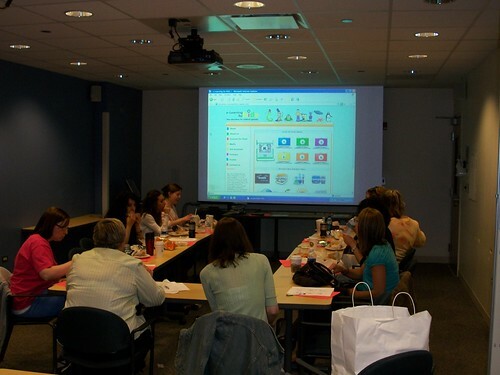 View the Chicagoland Learning Leaders Conference CSR (corporate social responsibility) Goals for 2009 regarding netbooks for Kids in Children's Hospitals. On Oct 30, 2009 at the 8th Annual Chicagoland Learning Leaders Conference held in St. Charles, IL, $2,400 was donated to purchase 6 netbooks for a pilot at 6West. We delivered the 6 computers the week before Christmas. Expand through partnerships in the community to provide 50 netbooks at Children’s & engage other ASTD chapters to help other hospitals in Children’s Miracle Network (over 170 affiliated hospitals for children in other cities). In 2008, the Rotary Club of Winnetka-Northfield partnering with Chicagoland Learning Leaders introduced e-Learning For Kids, free and fun educational games, and Intel-powered ClassmatePC to 25,000 attendees at Rotary 2008 International Convention (Los Angeles, CA). In the Fall of 2009 with the support of Dr. Edward Ogata, Chief Medical Officer at Children's Memorial Hospital (Chicago, IL), the Chicagoland Learning Leaders Community donated 6Netbooks for 6West. 6West is a 22 bed unit with 15% of kids staying 10 days or longer per month. With the help of Chicagoland Chapter ASTD (CCASTD) & our strong Chicagoland Learning Leaders community we purchased & raised donations for the rest of the 50 laptops for the rest of Children's Memorial Hospital in May 2010. Now we are helping Children's Hospitals in other communities. Donate now to Netbooks for Kids in Children's Hospitals.